The first indigenously designed Chinese medical navy ship, "866 Daishandao", was put into service in Zhoushan, eastern China's Zhejiang Province on Monday, the CFP reports. 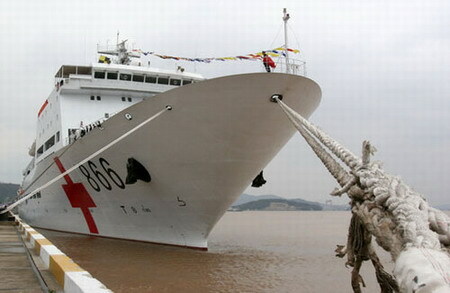 This ship makes China one of the few countries in the world to possess long range medical rescue capabilities. A large hospital ship is considered an important division of a modern navy. Besides a large helicopter landing pad, the ship is equipped with hundreds of beds, and advanced life saving medical equipment. Each sickroom has a nursing station and reaches a high level hospital standard. As the largest ship of its class in Asia, the main mission of the medical ship is to provide early medical treatment, assist in international peace-keeping missions and provide other humanitarian aid.